When Maggie finds herself in an awkward family dinner situation, will Alex give her advice and help her out? 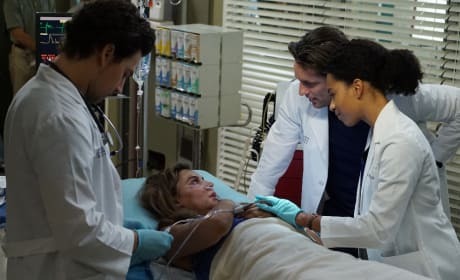 Maggie Pierce smiling at a patient during Season 13 Episode 14. Maggie and Nathan offer up a comfort and reassuring words while Andrew does a work up. Will things get awkward with Maggie working on the case with her ex, Andrew, and her crush, Nathan? 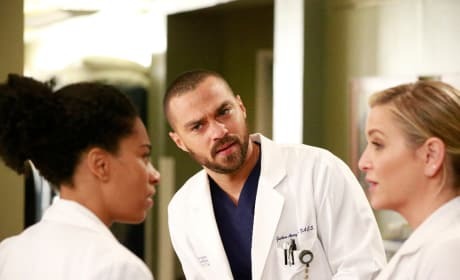 Arizona, Maggie, and Jackson meeting up at the Nurse's station. 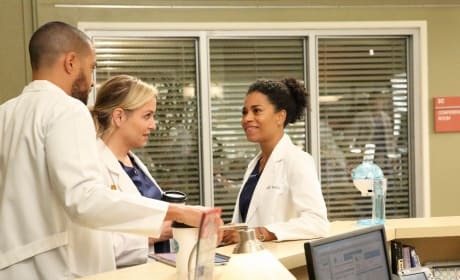 Are Arizona, Jackson, and Maggie still plotting on Richard's behalf? 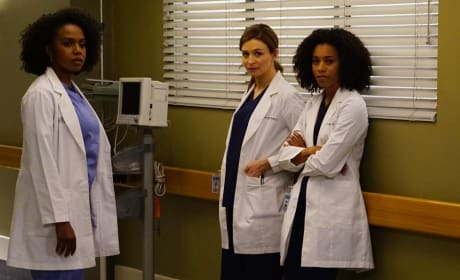 The ladies step aside as a patient's family says their goodbyes on Grey's Anatomy Season 13 Episode 3. Maggie is looking anything but lovestruck. Could Meredith have spilled the beans about her tryst with Nathan? Maggie takes a much needed coffee break. After a tough day filled with bullying and arguing parents, she needs to take a little time for herself. 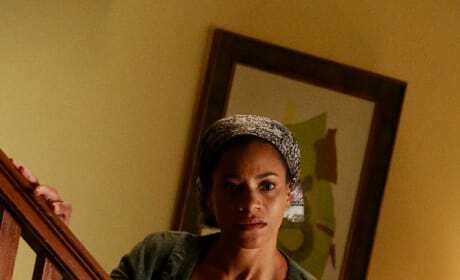 Maggie speaks to the wife. Maybe she's trying to calm the waters after witnessing what can only be a very embarrassing situation for all involved. This guy is really a trip. If this is what the home life of the young bullied patient is like, you can only imagine why things got so out of hand for her at school. Yikes. Carolyn: If you don't think you're worthy of love. If you don't think your love is valuable. You're wrong, and that's on me .... so put that on me and move forward. Amelia: What if I can't? Carolyn: Well, then that's on you. Lexie: [narrating] Grief may be a thing we all have in common, but it looks different on everyone. Mark: It isn't just death we have to grieve. It's life. It's loss. It's change. Izzie: That's how you stay alive. When it hurts so much you can't breathe, that's how you survive. Derek: By remembering that one day, somehow, impossibly, you won't feel this way. It won't hurt this much. Meredith: The really crappy thing, the very worst part of grief is that you can't control it. Meredith: The very worst part is that the minute you think you're past it, it starts all over again. 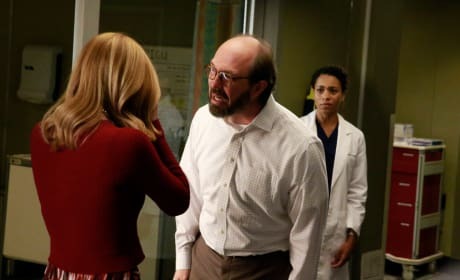 Grey's Anatomy Round Table: Did Amelia Find Closure? 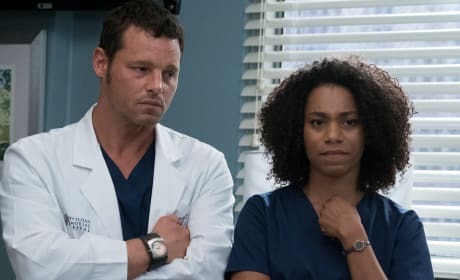 Grey's Anatomy Promo: Rom-Com Goodness! Grey's Anatomy Promo: Megan Hunt Returns! 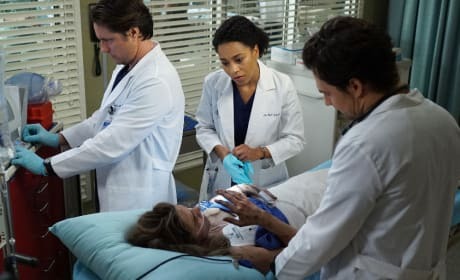 Grey's Anatomy Promo: An Incredible Jo-Centric Hour!